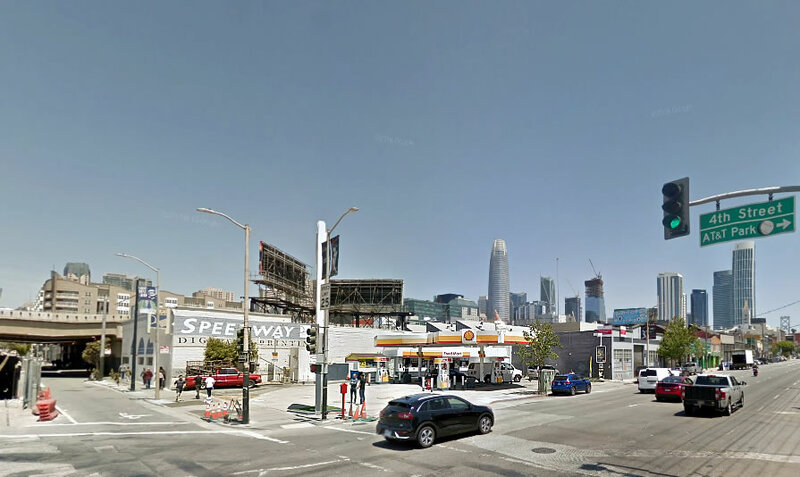 Plans to level the Central SoMa Shell station on the northeast corner of Bryant and construct a modern, 9-story office building on its 598 Bryant site have been abandoned. Instead, plans to level both the gas station and the adjacent Speedway Digital Printing building at 475 4th Street have been drafted. And as newly pitched to Planning, the parcels would be merged and a 20-story development would rise up to 209 feet in height on the site, leveraging California’s Density Bonus Law to build above the site’s 130-foot limit. The development as envisioned would yield 280 apartments, a mix of 168 one-bedrooms and 112 twos, over 5,600 square feet of replacement Production, Distribution and Repair (PDR) space at the corner of 4th and Stillman and a basement garage for 36 cars and 147 bikes. YES YES YES!!! Perfect location for something like this! 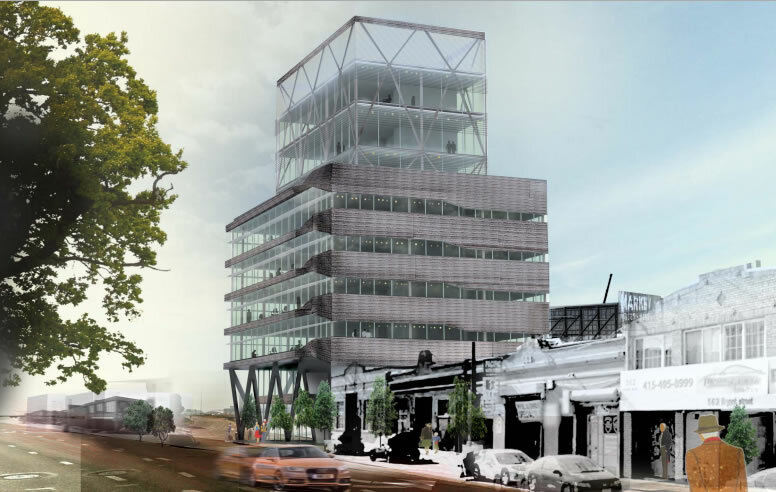 Agree, we need housing a lot more than office (though the office design was pretty cool looking). Go go go! Are there renderings? Great location! The development’s fine–build it now. But maybe put a new gas station on the ground floor somehow? In spite of the Luddite car haters fantasies, residents of San Francisco will continue to drive cars and those who don’t will increasingly get around via car sharing (as Muni becomes more dangerous and less reliable) and all of them will need a place to buy gas. We are now down to very few gas stations in the city and some neighborhoods have none. Admittedly suburban style gas stations are a waste of space but we need to figure out how to safely incorporate refueling locations into larger developments and this would be a good place to start. With more and more cars going electric, it sort of makes sense that we also need less gas stations. Although, your argument that we should build gas stations because Muni is less reliable is a bizarre one. 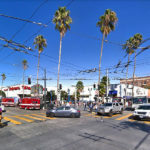 If Muni is indeed unreliable, why not build bike lanes rather than gas stations? The gas station at 3rd and South Park was just fenced off. Does anyone know what is going on there? Yes. They’re adding hydrogen fuel cell facilities to the existing station which will remain in service. Oh damn. Such a better location for housing! And hurray for that! There will soon be three hydrogen stations in the city, can’t wait. What is going to happen when we don’t have any gas stations anymore in SF? We have to be down to less than 30 stations in total city wide. To people that don’t buy gas? Nothing. To people that do buy gas? They will buy it somewhere else, or stop buying it. We have over 494,000 registered vehicles in San Francisco alone. You would think people would want to have some gas stations. If the market calls for more gas stations, I suspect they will find a way. And anyway, this area is flush with them–3rd near Brannan (about 1.5 blocks away), 5th and Folsom (about 2 blocks away) 6th near Harrison (about two blocks away). Good riddance. Walking is best. I love the residential density, but it’s very unfortunate to see no retail space at all on a corner lot, especially with the dead zone under the freeway nearby. And on 4th Street, which is supposed to be Central SoMa’s main street! This is a site that needs an active use. The best case scenario would be PDR with a small retail space in front, like Blackhammer Brewing nearby. But we could just as likely end up with a private PDR use that has all the windows curtained over and no signage. 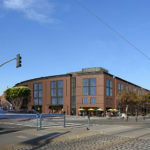 If so, the livability in this pocket of SoMa will be yet another victim of misguided PDR preservation policies. Air quality this close to the freeway is noxious. To help the neighborhood, this project must include a grove of redwoods facing the freeway. SOMA citizens deserve help cleaning the air.